An introduction to librarian and reluctant sleuth Raymond Ambler in this first book in a new mystery series by Con Lehane. It doesn’t matter if you’re stopping in your favorite library to quickly pick up a book, or settling down for a day of research, it’s inevitable that other books catch your eye. How did you not know about this one? Wait, another one?! Where has that one been all your life? Soon you’re plunging deeper into the stacks, fascinated by potential treasures. The day grows dim outside and when you finally emerge – well, when did the evening show up? Con Lehane’s Murder at the 42nd Street Library, the first in his new series, has the same absorbing effect. It’s a satisfying, slow-burning, complex mystery where, of course, the case is of utmost important to the characters, as it is in any mystery. But Lehane involves many more characters – and not just your typical suspects or law enforcement members. Raymond Ambler, for example, is the New York City research library’s crime fiction collection curator, and he is working hard to figure out who shot Dr. James Donnelly in Library Director Harry Larkin’s office. Moreover, as Ambler gets deeper into the case, aided by his vast knowledge of crime fiction and his personal reasons for crime solving, various factions in the library become more deeply involved. Chief among them is Maximilian Wagner, a blowhard biographer doing research in the collection of significant mystery writer Nelson Yates, who we learn later is slowly losing his mind. It’s what Yates’s disturbing past includes that drives most of the mystery. 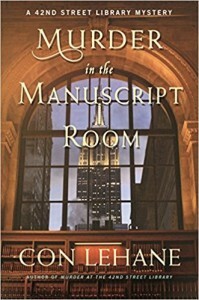 The rest of the novel’s characters are intricately and tightly woven together as they give their own perspectives in various chapters; from Adele, Ambler’s friend who wants far more than the small life her mother left behind; to Mike Cosgrove, who’s on the NYPD homicide squad and who has a lot in common with Ambler – especially their wives, both past and present; to Lehane’s previous creation, bartender Brian McNulty, who led Lehane’s three previous mysteries, proving to be the kind of helpful ally who doesn’t always want to do what you claim you need done, but when times get desperate, he’s there. All of this feels like a full-scale deconstruction of the mystery novel. Especially Ambler’s knowledge of crime fiction, full of observations like “in most murders the victim knows the killer,” which seem to reveal to the reader the moving parts of a mystery. But Lehane trusts that the reader will still follow along, and perhaps gain even more interest by seeing what makes a mystery tick. The varied detours from the mystery into the lives of these characters keeps us riveted too, which gives us time to breathe and provides almost two novels in one: the mystery, of course, but also a character-driven story, as these people have fascinating lives! Mike Cosgrove being a “self-taught epicure,” for instance; and the curious shoeshine boy, who plays a prominent part in the mystery. And that library. Oh that 42nd Street Library! Even after the immense pleasure of knowing many of these people, the descriptions of the library, its stacks, and its offices are even more reason to read this mystery. There are continuous sighs of envy as more and more of it is revealed, imagining oneself there, and realizing that Lehane got to essentially live in this library twice – once for research, and then again in the writing of the novel. This will certainly happen a third time when the second book comes out, and there’s no doubt that Lehane has a lot more to mine, both in the library and in mysteries to come. Library lovers are welcome here. 05/17/2016 © www.bookbrowse.com. All rights reserved.